Congressional oversight agency urges FDA to make better use of foreign offices with more effective performance measures and staffing goals; GAO notes agency’s progress towards risk-based inspections – and its plan to revisit every site at least once every five years. Noting that FDA still has not inspected one third of the foreign manufacturing facilities that export pharmaceuticals to the US, the General Accountability Office urged the agency to do more to strengthen its overseas drug inspection program in a report released Jan. 17. In particular, the congressional oversight agency encouraged FDA to better assess the effectiveness of its foreign offices and to set staffing goals for them. Responding on behalf of the agency, the Health and Human Services Department concurred in the recommendations and said FDA is already working to address them. The report comes as Congress is yet again discussing drug importation legislation as part of the debate on Rx prices, and one can see it as bolstering either side: There’s so much about foreign drug markets we don’t know, an importation skeptic might note, but an importation proponent might ask how much risker the scheme could be if the regular channels already rely on suppliers that have never been inspected. That report came on the heels of a tainted heparin incident that revealed flaws in oversight of the global pharmaceutical supply chain and led Congress to enact supply chain regulatory reforms in 2012 as part of the FDA Safety and Innovation Act (FDASIA), which also renewed and expanded the agency’s user fee programs. The oversight agency acknowledged in its latest report that FDA has made much progress since its 2008 report and a 2010 follow-up that said the agency hadn’t yet visited 64% of foreign manufacturing facilities that were exporting drugs to the US. 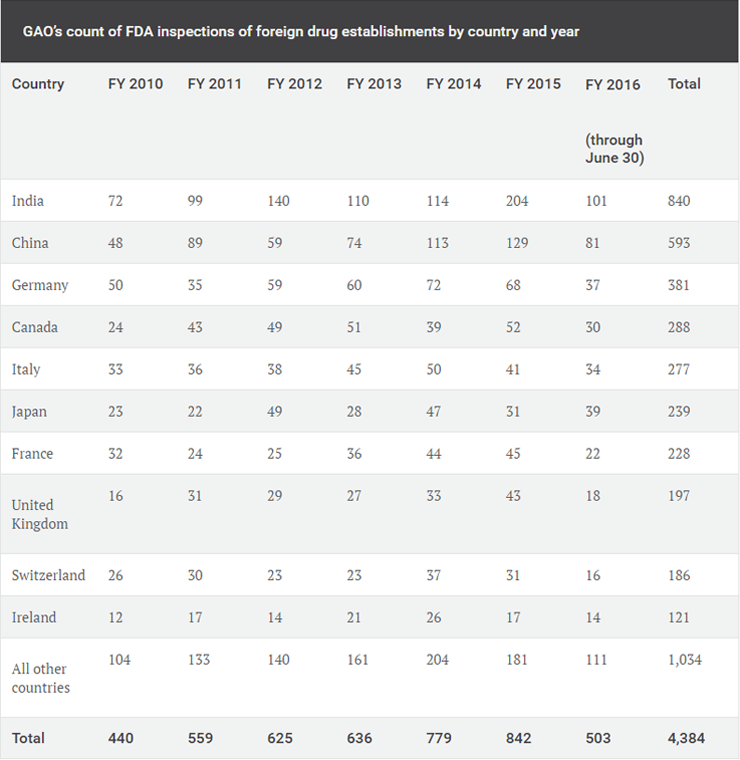 GAO said FDA has been increasing the number of foreign inspections each year – even reaching the point in 2015 of conducting more drug GMP inspections abroad than in the US. As of June, 2016 was looking to repeat that performance. US-based investigators in FDA’s Office of Regulatory Affairs have been conducted about half of the agency’s foreign inspections, GAO said. The agency’s US-based dedicated foreign drug cadre has been growing since it was established in January 2009, and now handles nearly a third of foreign inspections. Another 80 investigators hired with Generic Drug User Fee Act funds have only conducted 8% of foreign inspections during the period GAO reviewed, but their work volume increased significantly over the past two years. Meanwhile, investigators based in foreign offices have been involved in only 5% of foreign drug inspections, and staff on temporary duty assignments abroad have participated in just 2%. GAO documented a major change in the type of inspections FDA has conducted abroad over the past eight years, thanks to a FDASIA-mandated risk-based inspection scheme, the use of generic drug user fees and the retirement of a policy to limit foreign surveillance mainly to facilities receiving preapproval inspections. Last fiscal year, the agency’s Office of Regulatory Affairs finally combined domestic and foreign establishments into a single list, with funding priority set by the agency’s risk-based site selection model. Also, beginning in fiscal year 2017, FDA will endeavor to revisit each of the 3,000 or so manufacturing establishment that export drugs to the US at least once every five years. This initiative will start with a concerted effort to inspect the approximately 1,000 foreign establishments that the agency has never before visited. FDA last year also established a formal governance structure for annual review and improvement of its site selection model. There is now a review board that tweaks the model’s factors and weights based on input from subject matter experts. FDA has made progress in strategic planning for its foreign offices since GAO last reported on them in 2010, the congressional oversight agency said. For instance, each office now has a quarterly-updated annual operational plan. FDA has made progress on recommendations GAO made in 2010 to enhance foreign office strategic planning. There now are two performance measures in place: one for foreign inspections by foreign office staff and the other for collaborations with foreign regulatory authorities or other US agencies. However, GAO said that even though FDA opened those offices in part to help increase foreign inspections, their staff have conducted relatively few inspections. From FY 2010 through Jun 30, 2016, the India, China and Latin America offices have only taken part in 241 drug inspections, GAO said. And FDA chose to track all Office of International Programs collaborations rather than just those of the foreign offices, so it is not possible to see how much those offices collaborated. GAO also complained that FDA was unable to show how effective the foreign offices have been. GAO urged FDA to work harder to fill vacancies in its foreign offices. As of July 2016, 25 of 54 authorized full-time positions overseas, or 46%, remained vacant. The problem was worst in India, at 68%, followed by Latin America, 43%, Europe, 33%, and China, 32%. GAO found that the agency was having particular difficulty filling certain positions. The vacancy rates were highest for international program policy analysts (60%), followed by investigators (55%). In fact, 10 of India’s 13 authorized investigator positions were vacant, for a 77% vacancy rate in the country that has become most identified in the minds of many for GMP violations. “Given that one of the reasons for opening the foreign offices was to conduct inspections, the large number of vacant investigators is concerning,” the GAO said, noting that in-country inspectors can reach sites more quickly and stay longer. Some of the key factors in these high vacancy rates: the nine to 12 months required to complete overseas deployments; the likely hesitance to apply among FDA staff who have seen how difficult it is for returning foreign office staff to reintegrate into the agency’s domestic offices; financial concerns associated with the lack of locality pay; environmental and security concerns; personal reasons; and unfamiliarity with FDA’s global mission. The agency has worked to reduce vacancy rates abroad by encouraging staff to apply for temporary duty rotations of one to four months abroad. About a quarter of those who took temporary assignments went on to work fulltime overseas. GAO raised some concerns about the strategic workforce plan the Office of International Programs established in March 2016, complaining that it set an office-wide vacancy reduction plan instead of focusing on the overseas locations, which have the highest vacancy rates. There is a reintegration concept paper, but what the agency really needs are reintegration performance measures, GAO said.